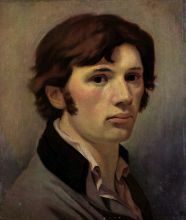 Philipp Otto Runge (1777-07-23–1810-12-02) was a Romantic German painter and draughtsman. 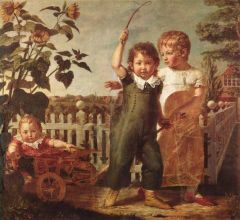 Although he made a late start to his career and died young, he ranks second only to Friedrich among German Romantic painters. 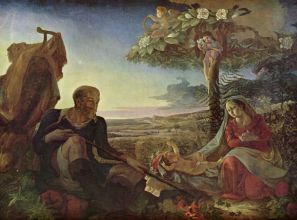 Born within a family of shipbuilders, Runge, after the reading of poet Ludwig Tieck, decided to pursue an artistic career. Runge studied under Jens Juel at the Copenhagen Academy (1799-1801), then moved to Dresden, where he knew Caspar David Friedrich. In 1803 he settled in Hamburg. 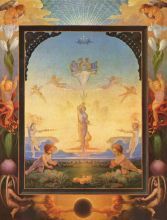 Runge was of a mystical, pantheistic turn of mind, and in his work he tried to express notions of the harmony of the universe through symbolism of colour, form, and numbers. He also wrote poetry and to this end he planned a series of four paintings called The Times of the Day, designed to be seen in a special building and viewed to the accompaniment of music and poetry. This concept was common romantic artistics trying to achieve "total art", or a fusion between all forms of art. He painted two versions of Morning (Kunsthalle, Hamburg), but the others did not advance beyond drawings. "Morning" was the start of a new type of landscape, one of religion and emotion. In 1810, the year of his death from tuberculosis, he published Die Farbenkugel (The Colour Sphere), in which he describes a three-dimensional schematic sphere for organizing all conceivable colours according to hue, brightness, and saturation. It was the result of years of research, and correspondence with Johann Wolfgang von Goethe. Pure hues were displayed around its equator; through the central axis was a gray value scale, from black at the bottom to white at the top. Across the surface of the sphere, the colours were graded from black to the pure hue to white, in seven steps. Intermediate mixtures theoretically lay inside the sphere. His sphere was adopted 150 years later by the great German teacher Johannes Itten. Itten opened the sphere into a star to display the entirety at once in 2-D.